Rome. Floods killed 12 people on the island of Sicily, including nine members of a single family, pushing Italy's week-long storm toll beyond 30, rescuers said Sunday, reported AFP. After a river burst its banks, the bodies of the family including children aged one, three and 15 were discovered in the town of Casteldaccia in the Palerno region. Their house was near a small river which had burst its banks, rescue services said. The other victims' ages ranged from 32 to 65. Three family members managed to escape, one by climbing a tree, the Agi news agency reported. "I lost everything, I have nothing left, just my daughter," one of the survivors, 35-year-old Giuseppe Giordano, told journalists. His wife, two other children, his parents, brother, and sister all died, he said. After flying over Casteldaccia on Sunday, Sicilian prosecutor Ambrogio Cartosio described scenes of "total disaster". Officials have opened an investigation to determine whether houses built near the river had complied with safety norms. In a separate incident in Sicily, a 44-year-old man was found dead in his car near Vicari, also in the Palermo region. He had been trying to reach a service station, where he was the manager, to help a colleague trapped there. A 20-year-old passenger in the car with him is still missing. Rescue workers are also searching for a doctor, 40, forced by the storms to abandon his car on the road near the town of Corleone after trying to drive to work at the hospital there. Two other people, a man and a woman, died after their rental car was swept away by a torrent in the region of Agrigente, rescuers said. Violent winds and strong rain had killed at least 20 other people this week around Italy, especially in the northern parts and around Venice. Two were reported killed on Friday, including a 62-year-old Germany tourist struck by lightning in Sardinia. Six regions remain on high alert for storms. The severe weather has caused massive damage and disruption. Trees in sprawling mountainside forests in the northeast of the country were flattened like matchsticks by violent winds. "It's like after an earthquake," said the governor of the Veneto region, Luca Zaia. "Thousands of hectares of forest were razed to the ground, as if by a giant electric saw." On Sunday, after flying over the area with Italy's Interior Minister Matteo Salvini, Zaia said the storms had destroyed 100,000 hectares (247,000 acres) of pine forest in all. Salvini posted photos of the devastation in a series of tweets Sunday after also flying over the Alpine town of Belluno. "We need 40 billion euros ($45.5 billion) to secure the national territory," he said. He pledged to collect and spend that sum but, in a barbed aside to the European Union, said he hoped his plans would not provoke overspending complaints from Brussels. Europe has objected to Italy's proposed budget, which it says will worsen the country's already huge deficit. The canal city of Venice, on Italy's northeast coast, has also experienced some of its worst flooding ever, and withstood winds of up to 180 kilometres an hour (110 miles an hour). The picturesque fishing village of Portofino near Genoa, a holiday resort on the Italian riviera, was only reachable by sea after the main road collapsed. An emergency path opened to let residents out was deemed too dangerous. 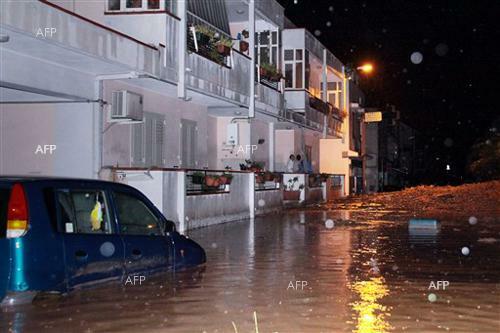 Floods in Sicily have closed many roads this week, and mayors ordered schools, public parks, and underpasses shut. On Sunday, troops were deployed to check the condition of the main roads on the Mediterranean island. Italy's civil protection agency has described the weather lashing the country this week as "one of the most complex meteorological situations of the past 50 to 60 years". © 2018 All rights reserved. Citing Focus Information Agency is mandatory!